"Wherever your Protection casts its shade, O All-Spotless One..."
Wherever your Protection casts its shade, O All-Spotless One, there the power of the devil is cast out, for every one of the faithful that calls upon you is saved. Therefore, we also hasten to your radiance that resembles lightning, and are made beautiful through the sprinkling of the Spirit, and are satiated with the grace that breathes forth fragrance, and spiritually rejoice, partaking of the shining rays of wonders. For you have become an inexhaustible spring of good things, and an ineffable gushing forth of healings. 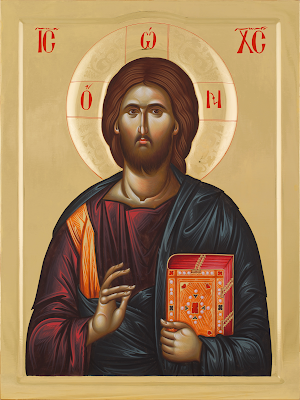 We entreat you fervently: cover us, O Greatly-Compassionate One, in the hour of Judgment, and deliver us, your humble servants, from eternal torment, for nothing is impossible through your entreaty. -Doxastikon of the Praises for the Feast of the Holy Protection of the Theotokos, Plagal of the First Tone. St. Isaac the Syrian: " Blessed is the man who knows his own weakness..."
Blessed is the man who knows his own weakness, because this knowledge becomes to him the foundation, root, and beginning of all goodness. For whenever a man learns and truly perceives his own weakness, at that moment he contracts his soul on every side from the laxity that dims knowledge, and he treasures up watchfulness in himself. But no one can perceive his own infirmity if he is not allowed to be tempted a little, either by things that oppress his body, or his soul. For then, comparing his own weakness with God's help, he will straightway understand the greatness of the latter. This is an excerpt from the life of St. Andrew the Fool-for-Christ (see the Great Synaxaristes for the full life of the Saint in English). When he began to act like a fool after God's call, his master thought that he had become possessed, so he had him bound with chains, and placed in the holy church of St. Anastasia the Deliverer-from-Potions in Constantinople, which was known for its many miracles and healings. What is moving about this passage is the speedy help of St. John the Evangelist and Theologian, and the vivid depiction of spiritual warfare. 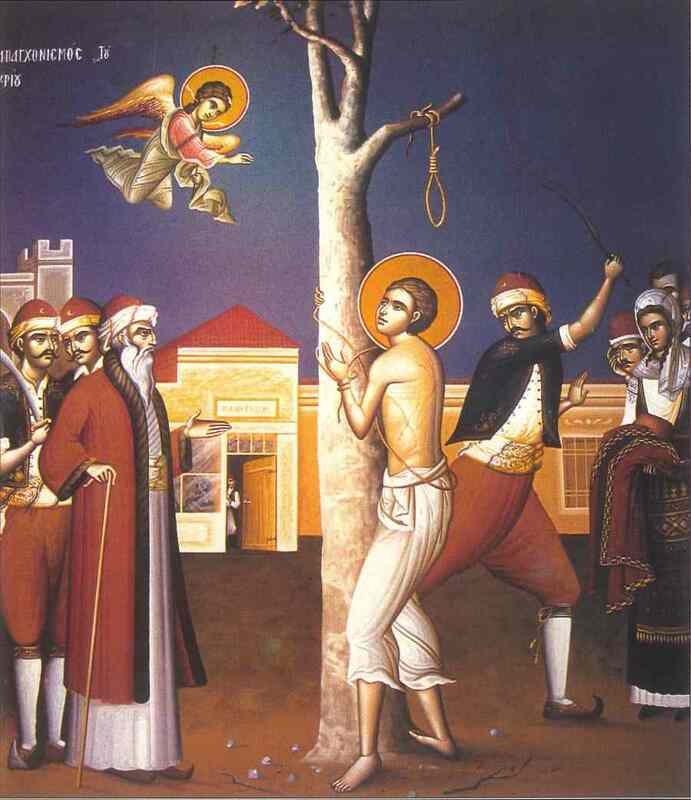 St. John is not physically "flogging" the bodiless demons, but the demons experience this punishment when coming into contact with the great love, purity and humility of the Triune God and of His Saints. May the Lord protect and defend us all from the demons, through the prayers of His Holy Ones! All of that day, bound as he was, [the Blessed Andrew] did not eat anything. That night, at midnight, as he was praying mystically to God and to the Martyr [St. Anastasia], the devil appeared to him visibly, appearing as a [dark being]. Together with him was a multitude of demons. Some were carrying pickaxes, others knives, others sticks and clubs, swords and spears, and others ropes. That dragon was the general. Because of this, many demons had come with him, in order to darken the blessed one. The [dark being], therefore, was foaming at the mouth. In this manner, the demons charged against him. Then, the blessed Andrew lifted up his hands and cried out with tears to God: “Lord, do not cast to the beasts the soul that confesses You!" And they brought him the first one. “Lay him down,” he said. Later they laid out and terribly flogged the second, followed by each of the demons. When the blessed Andrew heard the word “mercy”, he began to laugh. It appeared to him that the demons were bound and flogged perceptibly just like men. In reality, however, God was flogging them. And he was flogging them with such an astonishing beating, such that human nature couldn't bear it. 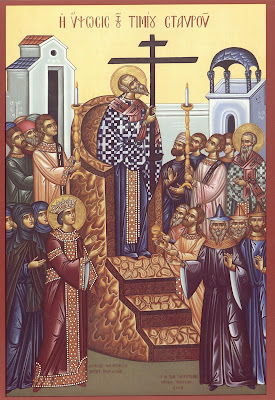 *Note: St. John the Theologian and his brother St. James were called the "Sons of Thunder" by Christ. "The summit of the Apostles..."
The summit of the Apostles, the trumpet of theology, the spiritual general, who made the whole inhabited world subject to God, come believers, let us call him blessed, revered John, translated from earth, yet not withdrawn from earth, but living and abiding the fearful second coming of the Master. O mystic bosom friend of Christ, ask that we, who celebrate your memory with love, may meet it uncondemned. "Now rejoice, O beautiful myrtle plant..."
Now rejoice, O beautiful myrtle plant, for you were sought by the Theotokos for a Throne and palace for her all-holy Icon, and with joy, you were wondrously sanctified by the Queen, who spoke forth from your branches. 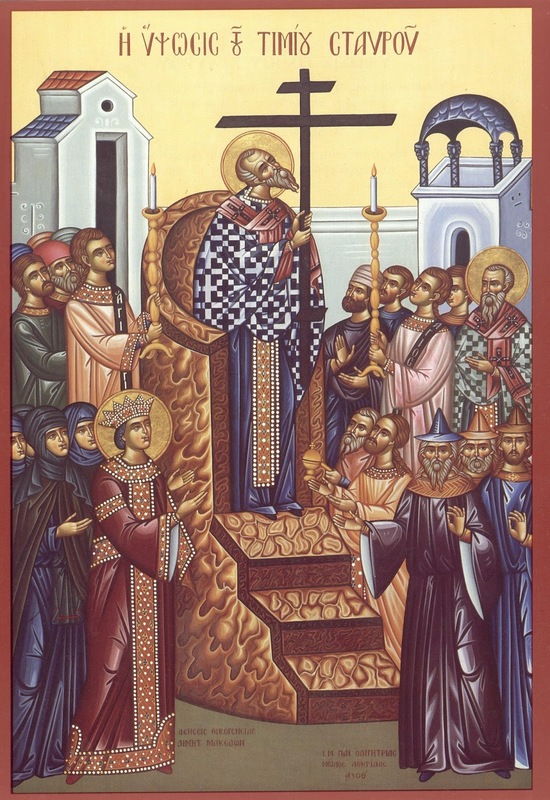 -Troparion from the Canon for the feast of Panagia Myrtidiotissa. The helpless child, with his innocent gaze, looked at his mother, and at the sun which was setting. He looked on high towards the heavens. “But I am a paralytic, my feet don't move and hold me up.” he replied. “Give me your hand, Georgie, get up on my horse. I am St. John from Russia, and our Lord sent me to bring you His grace and His healing power!" The child, half awake, then awoke his mother, who picked him up so that he wouldn't fall out of bed. In the morning when the night resident told the professor that the paralyzed child from Patras began walking that night, went with a hammer in hand, checked the child's reflexes, and plucked his feet with a sharp instrument, and he saw that his body was functioning normally. “Go,” said the professor, “God had something to do with you." "We venerate the wood of Your Cross..."
We venerate the wood of Your Cross, O humane One, for You, the Life of all, were nailed to it. O Savior, You opened Paradise to the Robber who approached You with faith. He was counted worthy of delight, confessing You, Remember me, O Lord. Accept us as You accepted him, for we now cry, We all have sinned against Your compassion. Do not abandon us. 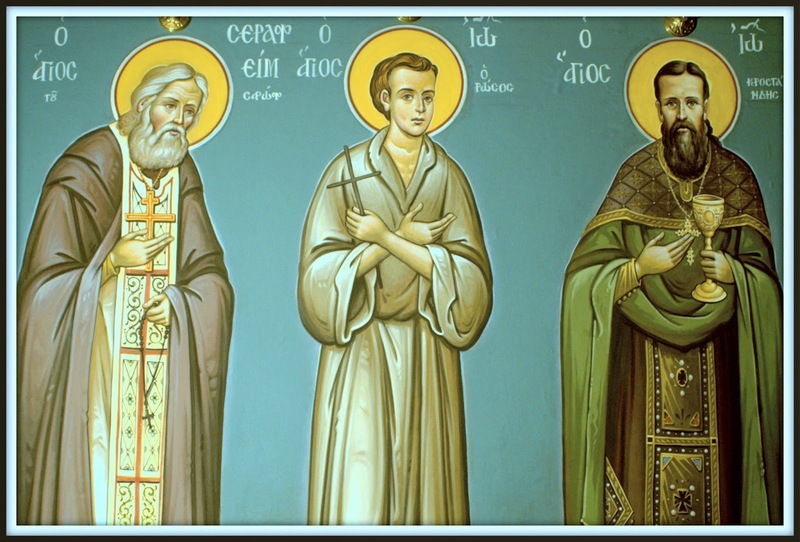 Note: The following is a service supplicating God, the Holy Trinity, to help a new martyr of Orthodoxy who is currently being tortured. These beautiful and moving prayers were written by St. Nikephoros of Chios (+1821), from a time several hundred years ago when, under the Ottoman Turks, the faithful would give their lives on a daily basis, refusing to deny Christ and their faith. And even in our days, there are many who suffer, and who will continue to suffer in the future, confessing Christ as the true God, Who put on flesh for our salvation, and refusing to worship foreign gods. May the Lord strengthen us all to witness to Him in word and deed, to the extent that we each are called. This is an amateur translation from the Greek text. I request reviewing this translation if possible before any public / liturgical use. Also note that the meter of this translation is not set to match the original music. Written by St. Nikephoros of Chios. Then the Troparion. Fourth Tone. To the Theotokos let us run. 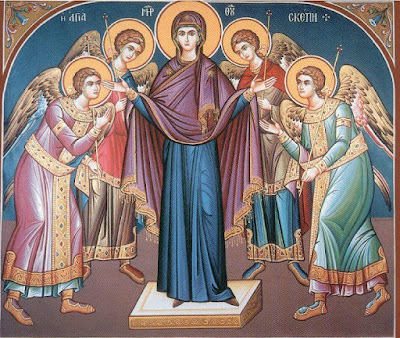 Let us entreat the thrice-hypostatic God, Father, Word and Holy Spirit, crying out from the depths of our souls with contrition: O Master Who loves man, through the protection of the Angels, and of the Mother of God, and of all the Saints, in the end, show him (her) who is now held and struggling for You, to be an invincible Martyr. Then the Psalm “Have mercy on me O God, according to Your great mercy...”, followed by the canon. Plagal of the Fourth Tone. Ode I. Crossing the water as on dry land. O Master and God Who loves man, O Almighty Father, All-powerful Ruler, through the intercessions of all the Saints, strengthen Your servant who is struggling. O Christ Savior, Who first bore witness before Pilate, through the protection of the Angels, and the prayers of the Prophets and Apostles, strengthen Your servant who is struggling. O King of heaven and God, the divine Spirit of truth, through the holy intercessions of the athletes and the venerable Saints, strengthen Your servant who is struggling. 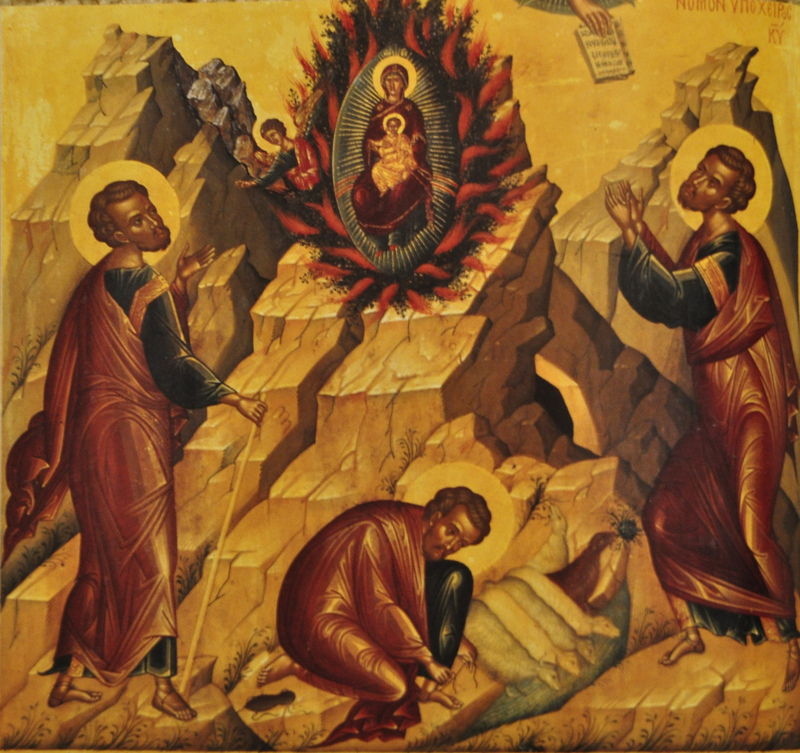 O Trinity in oneness, Father, Son and Divine Spirit, one power and strength, through the prayers of the Holy Theotokos, strengthen Your servant who is struggling. Ode III. Of the vault of the heaven. Through the divine prayers of the heavenly ranks of the Angels, O Merciful One, and of the Saints from all the ages, O pre-eternal Father, be merciful to him (her) who is struggling, and look down and strengthen him (her). O Only-begotten Word before the ages, O Uplifted One, Who unspeakably became man through Your ineffable compassion, strengthen and grant perseverance to him (her) who is being tortured out of love for You, through the prayers of all Your Saints. O thrice-hypostatic rule, the all-working power, Father, Son and Divine Spirit, through the prayers of the Mother of God, strengthen him (her) who is struggling for You, through Your all-mighty power. In Your good will, look down, O all-hymned Godhead, upon Your entreator, and with Your invincible might, protect him (her) who is struggling for you. O Beginningless Trinity, inseparable Father, Word and Spirit, have compassion upon Your good servant, and grant them victory from heaven. Troparion in the Second Tone. A fervent prayer. 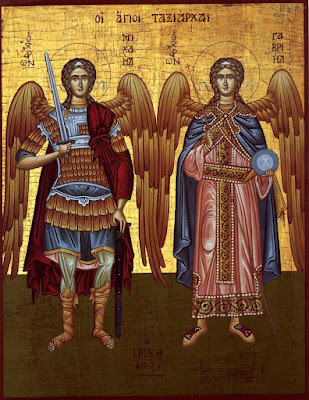 The multitude of the Angels, Prophets and Apostles, together with the Priests and all Hierarchs, the band of the Athletes and the city of the Venerable intercede on behalf of him (her) who is struggling and in danger, that he (she) be strengthened, O almighty Trinity. Ode IV. I have hearkened and heard, O Lord. Strengthen the mortal weakness, O all-powerful Father, of him (her) who, amidst struggles, chants to You: Glory to Your power, O Almighty One. Receive the spotless sacrifice, O Christ Who loves man, willingly offered to You, and show him (her) to be invincible, as he (she) chants: Glory to Your power. He (She) who is being tested by trials on behalf of piety, entreats Your grace of You, the Comforting Spirit, chanting: Glory to Your power. O Almighty Lord, Father, Word and Spirit, strengthen him (her) who is struggling on behalf of the faith, as he (she) chants: Glory to Your power. Ode V. Lord, enlighten us. Visit him (her) who is in dangers out of fervor for You, O beginningless Father, granting him (her) Your peace from above. Enlighten the nous, and pacify the heart of Your entreator, O Christ Who loves man, granting him (her) Your peace from above. May the good Spirit be poured out from the Father, to lighten the pains of Your entreator, granting him (her) peace from above. Through Your power, O almighty Trinity, protect him (her) who is struggling on behalf of the faith, granting him (her) Your peace from above. Ode VI. My supplication I pour out. O Lord, the spring of power, O almighty and surpassingly-good Father, look down upon Your servant who is struggling, and may their tortures not be senselessly abiding. Strengthen him (her) with Your divine strength showing him (her) to be perfect and invincible. You are my strength, I cry out, and power and foundation and deliverer, O Merciful One, and refuge and helper, my Christ. Grant your entreator in dangers perseverance, and show him (her), through Your power, O Jesus, to be perfect and invincible. 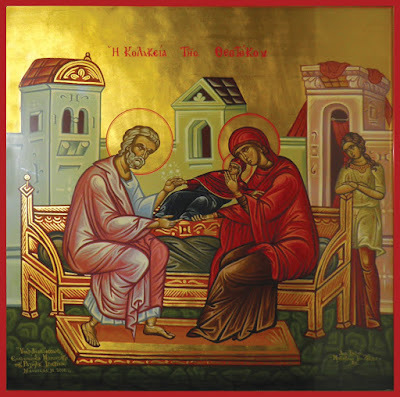 O Comforter, good and all-holy, I entreat that You visit him (her) who is in dangers, and who is struggling willingly, and lighten his (her) pain, and show him (her) to be invincible against visible and invisible enemies, through Your power. O Master, Almighty Lord, Fashioner of human nature, Father Son and Holy Spirit, through Your power, show Your entreator who is in dangers and tortures to be radiant, perfect and invincible. O God of all, with Your grace, visit him (her), who with fervent faith looks towards you, and grant him (her) who is in dangers patience and manliness. Make Your servant worthy to finish the divine course of martyrdom, and keep the pious faith, and to receive from You the crown of incorruption. And the Kontakion. Second Tone. O Protection of Christians. O thrice-radiant Godhead, beyond all being, Father, Son and Holy Spirit, through the intercessions of Your Saints from all ages, now be present, as the Good One, and visit Your athlete, and lighten the aching of their tortures, and mitigate the pains, that having struggled, Your all-holy name might be glorified. Verse: Let them be ashamed and turned back who seek after my soul. Glory. Father, Word and Spirit, Trinity in oneness, wash away my many personal offenses. Both now. Through the intercessions of the Theotokos, wash away my many personal offenses. Prosomoion in the Plagal of the Second Tone. Having laid up all their hopes in heaven. 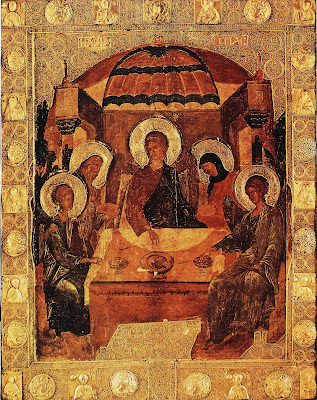 O Consubstantial Trinity, Father, Son and Spirit, tri-hypostatic unity, O God of all, help Your fervent servant who is suffering in dangers, and tortures and afflictions, and send down Your strength from above, showing him (her) to be invincible, and strengthen and support him (her) in soul together with the body, that until the end, he (she) might stand unshaken in the faith, and might receive the crown of struggling. Written by St. Athanasos of Paros. O Lord Jesus Christ, Son and Word of the living God, the Fashioner and Creator of all things visible and invisible, the strength of those without strength, the foundation of the storm-tossed, Who sets things aright and Who lifts up those cast down, the guide of the lost, and the hope of the hopeless, the supporter of those who struggle and the crown-bestower of the victorious, Who put on our infirm human nature, and did not disdain to wear it, Who did not come to call the righteous, but sinners to repentance, Who said through Your Prophet: “I do not desire the death of the sinner, but that he should return and live.” You, O Master Who loves man, all-compassionate and greatly merciful Lord, receive Your servant (name), Who once [may have] had a mindset of freedom and violence and the way of want, and with the guile and delusion of the serpent leader of evil on their shoulder (flee from this! ), and followed the enemies of Your holy faith and the delusion of godlessness before the godless tyrants, instead of Your all-holy and worshiped name, but now, has come to the knowledge of his (her) own fall, and desiring to be refashioned, hastened to the stadium to struggle, and has arrayed himself (herself) in Your almighty help and grace. 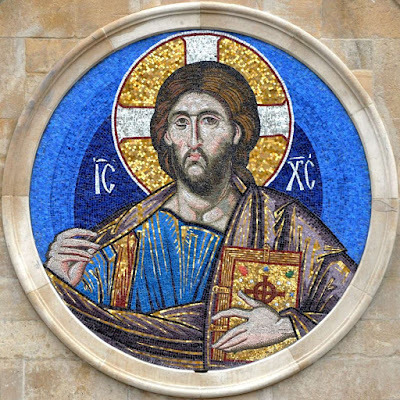 And now we pray to You, we sinners and unworthy ones, O Jesus Christ, the true God, Almighty One and Ruler over all: strengthen, support, make firm until the end, Your servant (name) who is struggling on behalf of You and of Your holy faith, and show him (her) to be a witness of the truth in the end. For You said, O Master, through Your holy mouth, that: “Without me, you can do nothing”, and furthermore: “The spirit is willing, but the flesh is weak”, for You said this and we confess it. 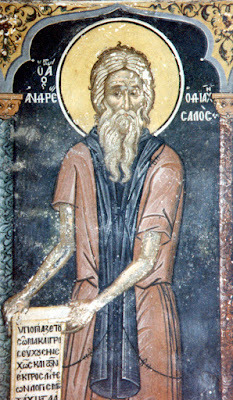 Therefore O Lord, the lover and savior of souls, receive this one who has fled indifference and before men confesses You to be the only true God, and the Judge of the living and the dead, as You received the confession of Your Apostle Peter, and James the Persian, and a multitude of others of like nature to him, make him (her) worthy of Your ineffable love for man, that he (she) be guided towards this good confession and brave stance and to complete all things perfectly until the end, that the faithful might be gladdened in him (her), and therefore glorify Your all-holy name, the leader and founder of our holy faith, together with Your Father and Your all-holy, good and life-giving Spirit, the one and only Godhead and life-creating Trinity, unto the ages of ages. Amen. Ode VII. Once from out of Judea. O only hidden One, inscrutable foundation, beginningless Father, confirm in the faith Your servant who is struggling, and who chants to You from the heart: O the God of our Fathers, blessed are You. O Christ, grant that Your servant might count the tortures as nothing, and not be swayed by anything in life, and be brought forth to suffer and to die willingly, chanting unto You the Creator: O the God of our Fathers, blessed are You. O All-holy Spirit, Who grants manliness unto the souls of the Martyrs, through Your illumination, strengthen him (her) Your servant who is struggling, and cries out: O the God of our Fathers, blessed are You. 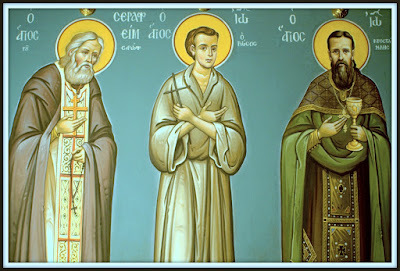 Through the intercessions of the Martyrs, the Prophets and the Apostles, O undivided Trinity, strengthen Your servant who has boundless fervor for You, and is surrounded by dangers, and who chants: O the God of our Fathers, blessed are You. Ode VIII. The King of heaven. The Eternal One, the eternal beginningless Begetter, grant deliverance and guidance through tortures to him (her) who hymns Your might. O Christ, the right hand of the Most-High, grant Your helping hand through tortures, to him (her) who hymns Your might. The all-powerful and all-governing divine Spirit, grant power from on high, to him (her) who hymns Your might. The almighty and all-working Godhead, quicken and deliver from on high him (her) who hymns Your might. Ode IX. Saved through you, O Theotokos. O Lady Theotokos, the protection of all, intercede towards God and the Father on behalf of him (her) who is now struggling to glorify Him. 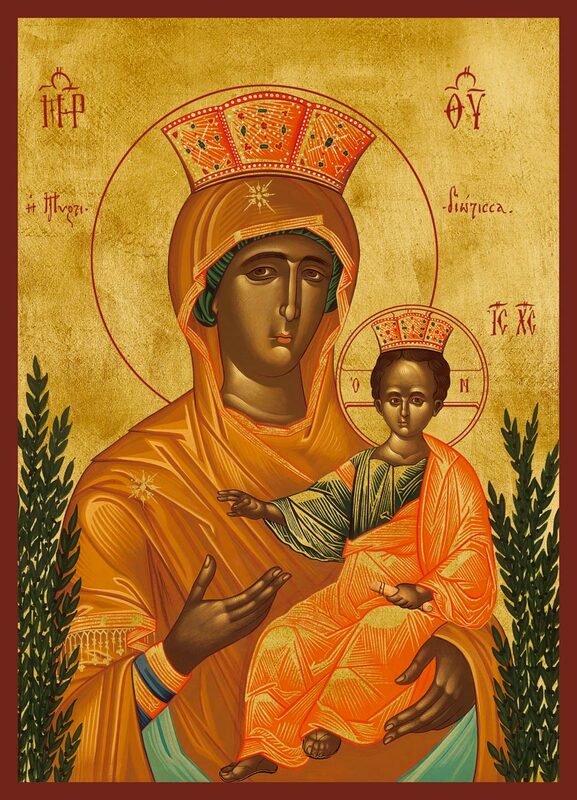 O Lady Theotokos, offer up your motherly intercessions to Your Son, O Spotless One, on behalf of him (her) who is now struggling to glorify Him. O Lady Theotokos, offer up intercessions to the divine and good Spirit, of behalf of him (her) who is now struggling to glorify Him. O Lady Theotokos, intercede to the all-holy Trinity with your divine intercessions, on behalf of him (her) who is now struggling to glorify Him. O Father, Word and Spirit, the one God, through the intercessions of the Theotokos, as the good and merciful one, make him (her) worthy who is now being tortured on behalf of Your glory, to finish the course. And after the Dismissal, the following Troparion in the Second Tone. When, from the tree. 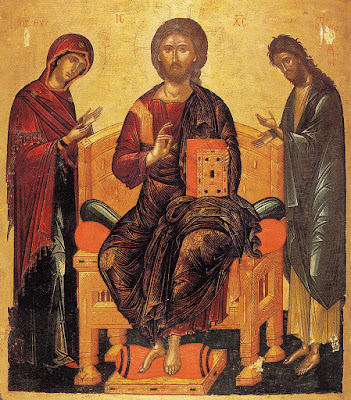 O Trinity of equal throne and honor, O Father and Son and Spirit, as the Merciful One, receive our fervent supplications, offered from Your servants with our whole soul and heart to Your incomparable goodness, on behalf of Your servant, that he (she) be granted strength from on high, that Your Godhead might be glorified. "Today is the proclamation of universal joy..."
Today is the proclamation of universal joy! The barrenness of humans is pardoned, for the barren Anna becomes a mother of the virginal Mother of the Creator! 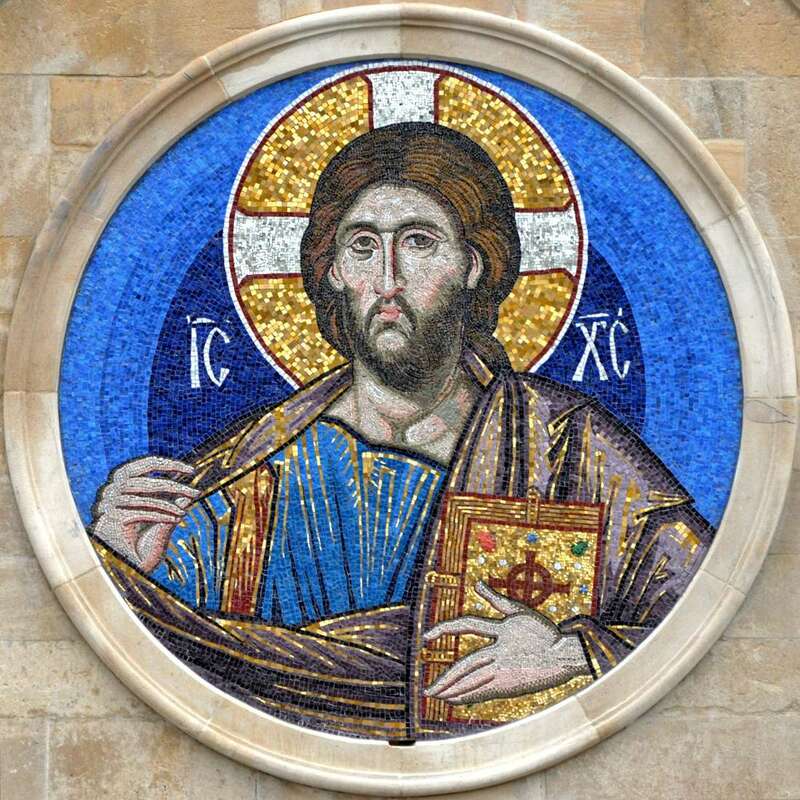 The One Who is God by nature has taken our human nature and has worked salvation in the flesh, Christ the Lover of mankind and the Redeemer of our souls. Elder Ephraim: "Let us attend on high..."
"Contemplate the love of our Jesus; the love of Jesus will overpower every other natural love. The more we renounce, the more love of God we shall enjoy. Let us attend on high, where Jesus sits at the right hand of God. Let our eyes look on high, for the eternal and everlasting things are above, not below; for everything here is dust and ashes. Reflect on the luxuriousness of heaven: the infinite wisdom of God is there; inconceivable beauty is there; the angelic melodies are there; the riches of divine love are there; the life free from pain is there; the tears and sighs will be taken away there; only joy, love, peace, an eternal Pascha, and an unending festival are there. “Oh, the depth of the riches and knowledge of God!” (cf. Rom. 11:33 ). “Eye has not seen, nor ear heard, nor have entered into the heart of man the things which God has prepared for those who love Him” (1 Cor. 2:9 ). Attend to the prayer; persevere in prayer, and it will put everything in order. Do not yield at all; remain firm in your holy goal. Remain beside Jesus to live with spiritual happiness. There is no happiness anywhere except in Christ. So-called “happiness” outside of Christ is incorrectly called happiness, since it is obtained with reprehensible means and since it ends quickly and leads man to the eternal unhappiness. "O how awesome is your form..."
O how awesome is your form, and how truly wondrous is your beauty, O Michael, for your glory is shown to us as surpassingly bright, for all those who desire you, and you endlessly work incomparable wonders! 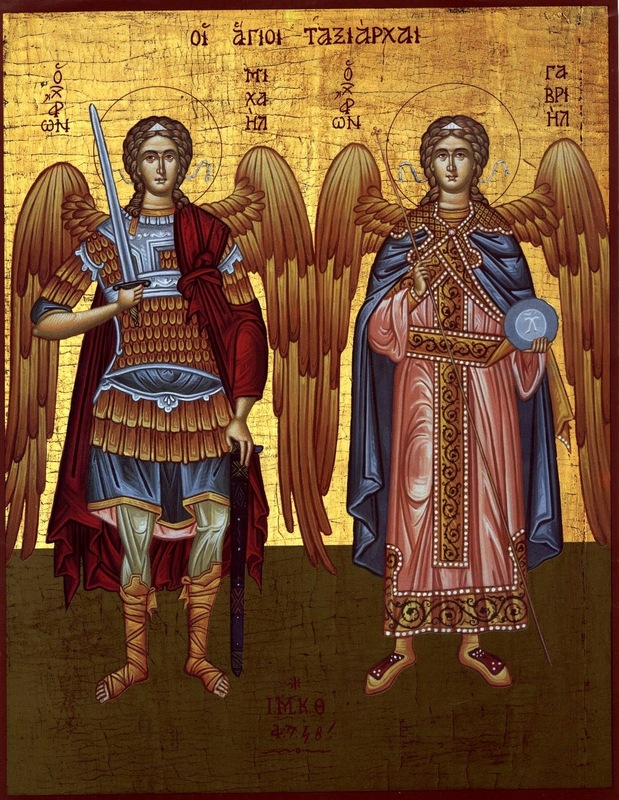 As you are the beautiful and joyous pair that serves the commandments of the Master upon the earth, O Archangels [Michael and Gabriel], deliver from dangers, and shine upon all with your saving and divine light, from the divine Spirit. "When the Lord descended upon Mount Sinai the Hebrew people were ordered to prepare and cleanse themselves beforehand. 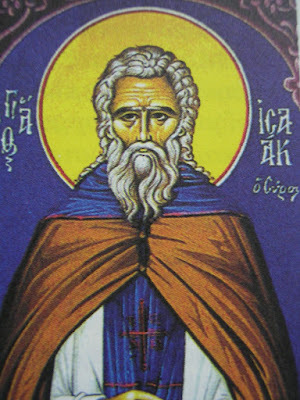 In the Divine Liturgy we have an even greater event than God's descent upon Mount Sinai, here before us is the very face of God the Lawgiver. When the Lord appeared to him in the bush on Mount Horeb, Moses was ordered to put off his shoes from his feet: but here God is manifested in a manner far greater than upon Horeb; there was only the type, here is the antitype Himself." "Your paths, O God, your paths are great and wonderful..."